I like traveling but 8,391km and 36 hours of moving around is too much in 9 days! An average of 932km per day! Ouch! 2,556km driving, 311km by Train and 5524km by Plane! I’m moving back to Montreal so I need to get some of my stuff, prepare my trip back home and say goodbye to my family. I live with my girlfriend in Etaples in the north of France but my stuff is at my mother’s place in the south of France near Toulouse. On Monday I drove 930km – about 9 hours straight. 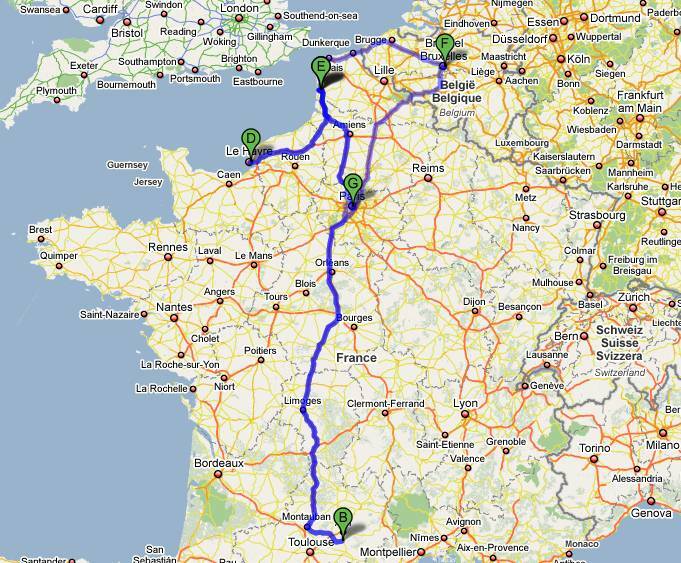 Two days in the south and Thursday I’m going back to my girlfriend’s in Etaples so that’s another 930km and 9 hours of driving in France. Friday I rented a small truck in Etaples to transport all my boxes to Le Havre, the port where the boat departs for Montreal. With return, that’s 440km and about 4 hours of driving. Then I spend my last weekend in 2008 with my girlfriend before I leave to Brussels to see my family on Monday, 262km – about 2 hours 30 mins. Wednesday morning, I’m taking the Thalys TGV train from Brussels to Paris to catch my plane which departs at 12h25! 311km – about 1h30 hours. I hope I don’t miss it! And finally the big trip by plane, Paris to Montreal, 5524km and 7 hours flight. Friday I have an important interview for a job as a Online Marketing Manager in Montreal! Ouch! That’s a total of 8,391 km – about 36 hours of traveling in 9 days!